Once you know how to use fresh turmeric, you’ll always have it at the ready! It’s easy to use and it’s gorgeous! Known for giving curry its golden color, turmeric has a peppery, warm flavor and a fragrance reminiscent of citrus and ginger. Widely used in Indian and other South Asian cuisines, it’s also known for having numerous health benefits.dAccording to Melissa’s Produce, turmeric is going to be a very hot culinary trend in 2016 — in fact, of their top 10 new trends in produce, it’s number 3 on the list! And I read on U.S. News Health, that it has been proclaimed to be the spice of 2016! And for many good reasons . . . .
Fresh turmeric root is incredibly versatile. Not only does it impart its stunning, vibrant golden color to whatever it’s cooked with, it also adds its lovely peppery, warm and subtly bitter flavor. Puréed into soups, stews and sauces. Or even mixed into cocktails! The health benefits seem endless. Turmeric is said to be a natural anti-inflammatory and an antioxidant. It has also been linked to improving brain function, and aid in treating arthritis, depression and Alzheimer’s Disease. You can easily remove the skin with a vegetable peeler or a paring knife. 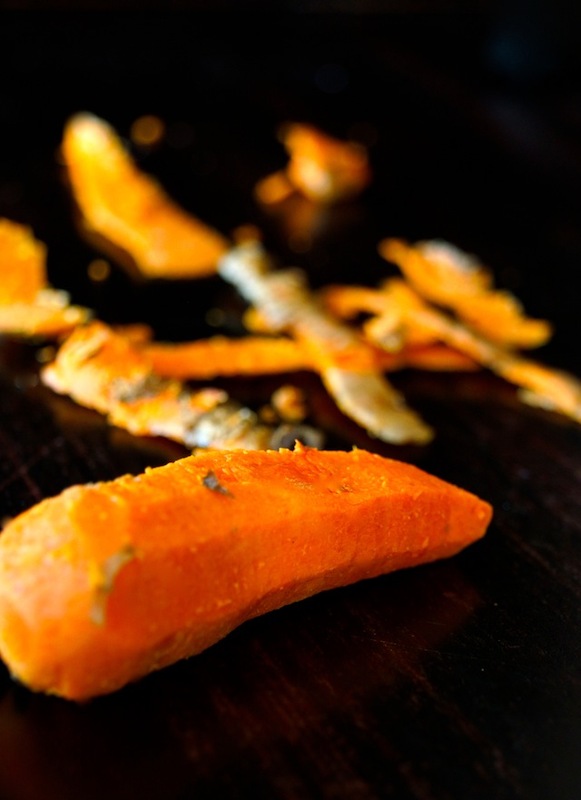 Though it’s much softer, fresh, peeled turmeric looks like a carrot. I like using a microplane zester to grate it — it creates tiny, soft shreds which are easily incorporated into recipes. And now that you know how to use fresh turmeric root, I’m going to be cooking up several new recipes featuring it for you, so stay tuned! This is not a sponsored post. Melissa’s Produce provided me with fresh turmeric for recipe testing, and as always, all opinions are my own. Thanks for your thoughts on turmeric Valentina. I have some to use and I’ve not gotten as creative as you have with it yet. I started using fresh over dried turmeric several years ago when I found it an an Asian market here in Tucson. It has so much more flavor than its dried counterpart- I just can’t go back! Looking forward to some fun ideas from you, Valentina! Hoping to deliver, David. 😉 I have a huge container of it so I’m determined to go through it via new recipes. Thanks for the instructions here! Turmeric is an absolute miracle worker. Have just purchased first raw turmeric at doctor’s suggestion for husband’s chronic pain. Thanks for pictures on how to peel/grate but no idea how to use in recipes. Suspect must use sparingly as he does not like curry. Appreciate any help. Hi Sue, I’m happy to help! And I do hope turmeric helps your husband. Please let us know if you think it’s effective. Here are a couple of recipes using the fresh turmeric . . . .